Introducing a New Group: UNEXPECTED READATHON TIME! 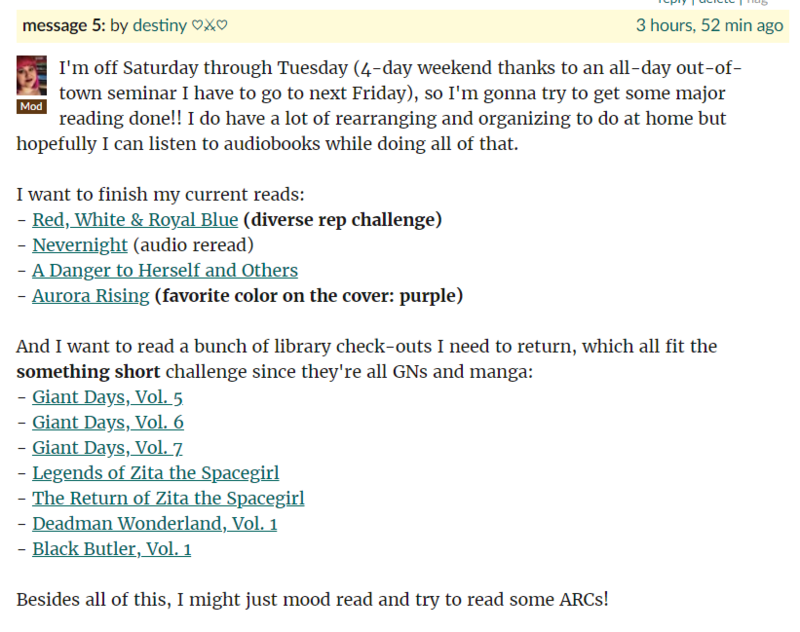 Helping Kathy with Devour Your TBR has reminded me of how much I loved running a Goodreads group back when I first started blogging, and I decided it would be fun to make a new one! It’s called Unexpected Readathon Time, and you can join it here. But… what’s the point of another readathon group? I know, they’re a dime a dozen, but the point of this one is that the readathons will all be impromptu.I’ll announce them anywhere from 24 hours to a week in advance, and you can sign up or skip depending on your schedule! The other point of the group is this: I wanted to create chill, low-key readathons. I love a reading challenge as much as the next person, but sometimes I just want a place to find some awesome motivation and reading buddies without the stress of reading specific titles to fit the prompts! Hmm. I’m listening. What do I do to join? The only “requirement” for the URT readathons will be signing up and letting us know how your progress is going when you can! For those who do want challenges, I’ll come up with 2-3 simple and COMPLETELY OPTIONAL challenges per readathon. You’re under no obligation whatsoever to fulfill them! Okay, I get it. When do we start?! I felt it was fitting that we kick off the opening of the group with a readathon right away (plus I have an unexpected 4-day weekend starting at 1pm today! *happy dance*), so the first readathon starts… TONIGHT! That’s right, this readathon begins on Saturday, March 2nd at 12:00AM in YOUR time zone and ends Tuesday night, March 5th, at 11:59PM (again, your time zone). I skimmed this post, honestly. Can I get a TL;DR? Okay, okay: go here and click “join group”. If you want, pop over to the intro thread and say hi. Then, find that big thread that says “Readathon #1” and sign up! Post a TBR if you want, let us know your goals, or just say hi — anything goes. And most importantly, HAVE FUN! Wait… what are YOU reading? You do NOT have to participate in every readathon — not even the first round! Even if you never join a readathon and just chat in the discussions, I’ll be happy to have you there. ♥ I hope you all have an amazing, book-filled weekend and I look forward to seeing you in the group! LOVE this idea, plus I’ll be spending a lot of time riding in a car this weekend so it’ll be perfect! I appreciate the optional challenges, too. I have three books in mind to complete: The Glass Castle by Jeannette Walls, The Girl He Used to Know (ARC) by Tracey Garvis Graves, and The Seven Husbands of Evelyn Hugo by Taylor Jenkis Reid – may not finish this one but it’ll be fun to try! Thank you! 😀 I’m so glad! I hope you love Evelyn especially, that’s such a good read!! I love this! I am behind on so much reading, and I’m trying to make up for that while I’m on spring break this week and next week. I’ll be adding to the discussion later today! Thank you so much!! 😀 This makes me so happy! Ahhh this is such a great idea! I’m going to try to participate a bit in the first one even though I work tomorrow. Thank you for starting this!! This sounds super awesome! I like the idea of this being so chill and spontaneous! i immediately joined the group and hope to participate in as many readathons as possible! I have a book that fits each criteria in mind for this first readathon, so it should be lots of fun! Yaaaaay, thank you! I’m so happy the idea is going over so well. 🙂 I hope you have fun and get lots of reading done! Bahahaha I literally LOL’d when I got to TL;DR 😂😂😂 Looking forward to joining the readalongs when I can!! Bahahaha thank you 😂 I’m so glad! I wish I could! I’ll catch the next one! Alright, I’m in 🤙 Can’t wait to see everybody’s updates (also, A Danger to Herself & Others was thrilling)! Yaaaaaaay, so glad you’re into it! 😀 Thank you! And I’m so intrigued by Danger so far, but I’m not far in, so I’m glad to hear you liked it! Thanks for the Goodreads group invite, I joined! That’s totally okay! ♥ I hope you can next time!! This is such a fun idea! I got really behind on reading blogs so I saw this a little late to really get into it, but I’m definitely going to keep my eyes peeled on the next round of the readathon!